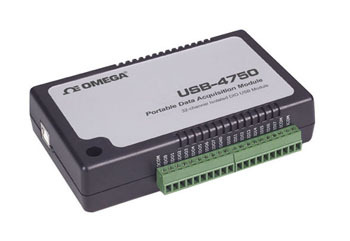 The USB-4700 series consists of true Plug & Play data acquisition devices. No more opening up your computer chassis to install boardsjust plug in the module, then get the data. It’s easy and efficient. The USB-4750 is a 32-channel isolated digital I/O module for the USB bus. With isolation protection of 2500 Vdc, and dry contact support, the USB-4750 is ideal for industrial applications where high-voltage protection is required. Each I/O channel of the USB-4750 corresponds to a bit in an I/O port. This makes USB-4750 very easy to program. This module also offers a counter or timer and one digital input interrupt lines to a PC. Users can therefore easily perform configurations by software. Reliable and rugged enough for industrial applications, yet economical for all types of projects, the USB-4750 is the perfect way to add measurement and control capability to any USB capable computer. The USB-4750 is fully USB Plug & Play and easy to use. It obtains all required power from the USB port, so no external power connection is ever required. Data collection is simple. Simply plug the data acquisition module into an available USB port and our easy-to-use Windows software does the rest. The software converts your PC into a real-time strip chart recorder. Data can be printed in graphical or tabular format. It can also be exported to a text or Microsoft Excel file. 참고: All USB-4750 data acquisition modules include Windows software and complete user manual on CD, and a 1.8 m (6') USB cable and DIN rail mounting kit.